Caiman free games: King Pong by Brusi Productions. 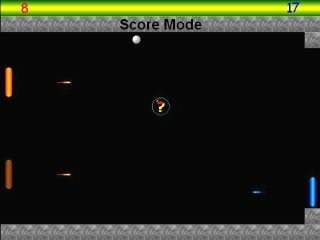 A nice Pong game with many powerups and special effects :) King Pong is a game for two players, based on the nostalgic game "Pong".By controlling a paddle, each player should block the ball and not let it break through his side. The players can shoot each other to freeze them and shoot the ball to thrust it towards the other side. Bonus symbols, such as size and speed, appear on the screen during the game. The players must shoot the bonuses to catch them. The game has three modes: score mode, time attack and a one player training match. The game contains sound effects and background music, including customized options, a high score table and a detailed help screen.